"Perfect breakfast to get you energized! Adding fresh fruit on top sets this off perfectly." 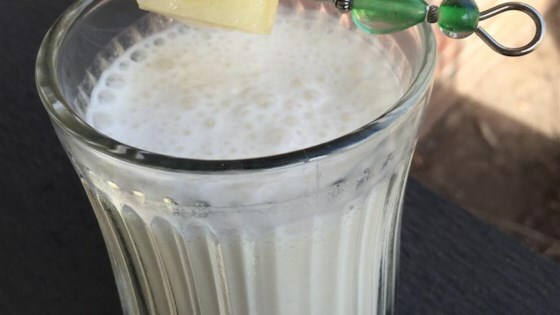 Combine water, coconut milk, pineapple chunks, ice, honey, and vanilla protein powder in a blender. Blend until smooth, 1 to 2 minutes. Great tasting smoothie. I also used coconut water and my pineapple was frozen so I eliminated the ice cubes. This was very tasty! I only had regular coconut milk and after reading the fat content, I only used half and put in more pineapple. Still turned out great and I will make again to the recipe. Yum!! Nothing more to say! I really enjoyed this. I replaced the water with almond milk for extra creamy flavour. The sweetness of honey was perfect. Very nice and creamy. I used coconut water instead of regular water, it added a nice touch. A very tropical flavored smoothie to start your day in a healthy way. If you like pineapple, this is fabulous! Refreshing, naturally sweet, delicious!